What is a Rain and Freeze Sensor? A Rain and Freeze Sensor is exactly what the name says, a sensor that detects rain events and freezing temperatures. A rain and freeze sensor is an added component to a sprinkler system, one of the few parts of a sprinkler system that are not located below the ground. In addition, a rain and freeze sensor can help you to save water and money! A rain and freeze sensor is a wireless sensor that is mounted to your house and communicates with your sprinkler system’s controller. It is typically mounted to the gutter or fascia of the house and is located in an area that is not blocked by tree limbs, leaves or other obstructions such as sheds, other portions of the roof, etc. The goal is to have the rain and freeze sensor located in an area where it can receive the best unaltered representation of the exterior environment. When the rain and freeze sensor becomes too wet (raining), it will not allow the sprinkler system to water, saving water and subsequently, saving you money. When the sensor becomes too cold (freezing temperatures), it will not allow the sprinkler system to water, saving possible injuries and eliminating dangerous situations on roads and sidewalks. According to Texas A&M AgriLife Research and Extension Center in Dallas, rain and freeze sensors can potentially save more than 500 gallons a day during rainy conditions (http://water.tamu.edu/rain-freeze-sensor/). The rate that your rain and freeze sensor dries out after a precipitation event is designed to replicate the rate at which your lawn dries out. If your sprinkler system will not turn on and there is a red alarm LED light lit on your controller (many models), consider whether or not your area has recently had rain. If so, the red alarm light is likely because your rain and freeze sensor has not yet finished drying out, mimicking your lawn. Just wait a day or two. This also indicates that your rain and freeze sensor is functioning properly. Many cities have requirements regarding rain and freeze sensorslisted on their websites and also have the requirements outlined in their respective City Ordinance documents. Most cities in our service area require that arain and freeze sensor is installed on all new sprinkler system installations. In addition, several cities require that arain and freeze sensor is installed when a sprinkler system controller is replaced on an existing system, if the system was not already equipped with a functioning sensor. Some cities even offer a rebate program when a qualified rain and freeze sensor is installed on an existing system that does not already have a sensor installed. 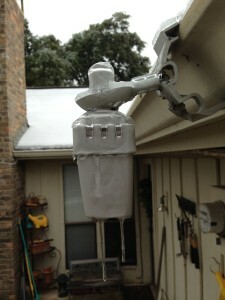 According to the City of Plano Water Rebate Program Residential Rain and Freeze Sensor Application (http://www.plano.gov/documentcenter/view/3567), the City of Plano will issue a $50 water utility credit for one rain and freeze sensor per household. If your sprinkler system is already equipped with arain and freeze sensor, check to make sure that it is still working. It is easy for your sensor to become clogged with cobwebs and debris, which should be removed. To check to see if your sensor is functioning, spray it with water and then look at the sprinkler system controller. If the controller indicates that it will not water (usually a red light), then the sensor is functioning.